I’ve had a lot of time with the Wooden Camera A-Box and I have really enjoyed using it. It not only works well, but it looks darn good doing it. Trust me when I say there isn’t a lot of elegant audio gear out there. If you’re looking for a small, stylish way to run your XLRs to 1/8″ this is the tool for you. 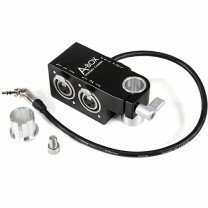 Best For: People looking to take 1 or 2 XLR audio sources straight to the camera. “strong” tag is still open on “Pros”. Good article, quite interested in this. Good save Dustin. Thanks, yeah I really like the unit. Probably the cheapest thing from wooden camera too ha! Hi, great video about a-box, thx for that…but i have a question, what is the battery with the red button? Looks like a battery pack powered by Sony batteries that can power your devices… I’m just diving into the battery power world, researching these as well as the professional “V-Lok” versions… This would be nice to eliminate a stockpile of different battery types for each device! Thanks for the review, Caleb! I wanted to compliment you on your current rig- I see the value of a full rig but also see how a client or interviewee can be intimidated by them. Your current version is very compact and looks like a legit video camera system, not a nerdy bunch of gadgets and gizmos attached to a DSLR. +1 Also clocked it during the review. Could be a battery plate for charging USB devices/ Laptops? Thank you Logan. Yes, it has taken a lot of time and work, but it is now a blast to work with. Love that thing! I really wish that there was something with this compact, elegant form factor that had an adjustable preamp and phantom power. The closest thing I’ve seen so far is the iRig Pre, which isn’t even designed for video work and needs to be modified for DSLR compatibility. JuicedLink has a few products that meet those requirements (although not quite as compact or elegant) but are supposed to be as good as any external recorder. Pricey though at $399 for the RA222, 2 XLRs w/ headphone jack & levels. Going off what Logan said, I would definitely recommend the juicedLink Riggy Micro (or Riggy Assist depending on what your needs are). I have the juicedLink RM222 Riggy-Micro and, personally, I think it’s better than most external recorders. I’m used to using the Zoom H4n, but the preamps in that aren’t great. I’ve been hooking a Rode NTG-2 into the Riggy Micro and the sound quality has been excellent so far. The Riggy’s have such a low signal to noise ratio that you can really push the gain on it. It’s also nice being able to plug the Riggy straight into a camera, so you don’t have to worry about having seperate audio files. The only complaints I have are that all of the switches are on the bottom, so you have to take it off the tripod, or whatever you’re using, to adjust things (though not the audio levels, there are two knobs on the side to adjust levels of each channel, which is nice). Also, the Riggy Micro doesn’t have a headphone jack, so you’ll need to use it on a camera that has one or get the Riggy Assist, which has a 1/8 inch headphone jack with its own level knob. Those are the only issues I have with it, but the pros definitely outweigh the cons. You should definitely check them out. Yeah, I know that JuicedLink, Beachtek, and Azden all have boxes that will do it – and the Tascam DR-60D will do it with external recording capabilities for $200 (at the moment). My bigger concern is that none of these options are really compact enough for easy handheld shooting and I worry about my camera setup ballooning into some sort of unwieldy Franken-rig. $200, no phantom power no pre-amps? Hard to justify when a JuicedLink allows professional quality audio straight into a camera. I’ve used my NTG2 with it and it worked fine. Just make sure you have a battery installed. Nice little set up. How would you go about shouder mounting this set up? All I do is slap handles on the front and go. You could also add a shoulder pad, but I honestly don’t shoot for more than a few minutes max (at a time) so going without a pad or using a towel works fine. My “Rode NTG-3 Shotgun Mic” requires phantom power, will this device work with it? Unfortunately this device does not provide phantom power. That’s too bad. I guess it can still be useful with a Lav Mic. Yes, I’ve used it with several cameras and my NTG-2. The best audio option is a mic going to a JuicedLink box and then to the camera. The A-Box is a minimal solution that gets the job done while staying small, but isn’t the best quality option. Traveling at the moment and can’t check. If you have a long enough 15mm rod it should work. Either way, you should be able to mount it somehow.